Cherish Creative have over 12 years experience in the ‘Design, Print & Promote’ industry. We offer a complete in house graphic design service, from original concept to finished printed product or high-resolution digital media with full functionality. We LOVE easy, beautiful, balanced things and we can create the perfect look for you. A professionally designed logo or ‘branding’ for your business can make a huge difference as to how your clients see you & relate to your business. We will work with you to create the best fitting design solutions that work for YOU. We can design or refresh not only your logo or brand, but also your business cards, brochures, posters, website & social media accounts. Logos, Websites, Business Cards, Menus, Promotional Posters, Invitations, Letterheads, Labels, Detailed Brochures or Direct Message Flyers ~ whatever you need we can CREATE it for you. We can help YOU to promote your business, product or service. To discuss your next design job with our team, email us here. 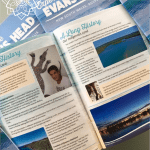 Cherish Creative proudly partner with Strategy Monsters Marketing Service to produce the Evans Head Tourist Guide annually. 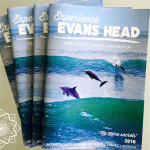 20,000 copies of the booklet, designed by Cherish Creative, are produced annually and distributed across New South Wales and into Queensland, Victoria and the ACT. Ahhhh, the finished product! From ‘a few’ to ‘a few thousand’ we have you covered. Cherish Creative can print a single Banner or 5,000 Brochures, any size, any stock. Actually, we can print just about ANYTHING! We have a long history working in the print industry and our experience means you get the best printed product for the lowest possible price. Thankfully, gone are the days of ‘standard’ printing that takes weeks to produce. At Cherish Creative, we work extra hard to work within our clients time frames and deadlines. 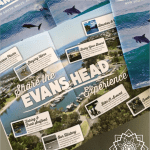 We offer fast turn around and free delivery to your door Australia-wide on most of our printed products. We print a large & diverse range of promotional products from the basic business necessities like business cards, letterhead, invoice books & brochures to the fun goodies with impact, like pens, notepads, stubby coolers & large banners. Promotional products that will get you noticed and will stay with your audience longer. These days everyone’s email inbox is full and our postal mail boxes are empty. 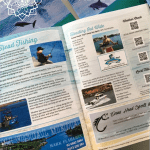 We have come full circle and clients are finding they relate once again to hard-copy printed, promotional material. If you hold it in your hands it has more impact and is easier to remember. There is no design, print or marketing job that our team can’t handle! Each job is individual and will be quoted as such, but to get an idea of what might be right for your budget, see our printing price guide or simply give us a call, we are more than happy to help you sort out exactly what you need. Cherish Creative can DESIGN and build your website and get your page ranking with search engines such as Google. Our professional themes are mobile ready and will automatically adapt to any device your site is viewed on. We use our graphic design knowledge to create a visually appealing, user friendly, functional & easily navigated website that can then be updated regularly with relevant promotions for your business. Cherish Creative are offer a full website hosting service. To view our plans & pricing please download our Website Price Guide. If you have any questions, we are only a phone call away 0421 490 530 or email us here. Cherish Creative offer a Social Media Management Services to approved clients. For more information please email us your requirements here.